I am an instructor at the Oyama school of Tsugaru Shamisen. I also play the “koto” (Japanese harp) and the Okinawan sanshin (gutair-like instrument). In addition to being experienced in Japanese music, I also have a deep understanding of Japanese arts and culture. I want to help expose non-Japanese people to Japanese culture through my work and teachings. Sensei was being very helpful and patient. It was very inspiring and most amazing experience to learn to play Shamisen and Koto with professional guidance. Would highly recommend anyone interested to experience! Easy to get to and our teacher spoke English. We were able to try our a variety of songs and the instructions were clear and our teacher was patient with us. We also got to listen to our teacher play so songs on both the shamisen and koto. 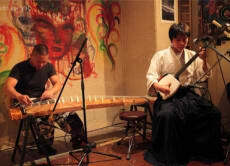 A great introduction to Japanese traditional musical instruments. Kozan-san was a fantastic teacher. My wife and I both have significant guitar experience and Kozan-san was able to leverage that into an all too short lesson. We learnt one of the Yoshida brother's classics and even had some time to get an intro into koto. I was so impressed by the lesson that I bought his book of Shamisen scores which has been a primary resource for me to understand Japanese music . We had a little trouble finding the teachers house but then we met him outside already searching for us. The lesson was really fun and time was flying by. My friend and me played both instruments each for the very first time and it wasn't easy (even for experienced guitar players) but the teacher was very patient and spreading nice vibes. Also he played some impressive songs when we asked him to play something for us. At the end he took some fotos of us playing the shamisen and koto. I was trying to look for Kozan-san's place without WIFI that day in the rain and got lost for a bit, ended up late by around 20 minutes. Kozan-san was very nice to extend the ending time for the class since his next class starts 30 minutes after the original ending time of my class. The whole experience was very unique and fun! I was even more charmed by shamisen after the class! Definitely recommending this class to my friends!